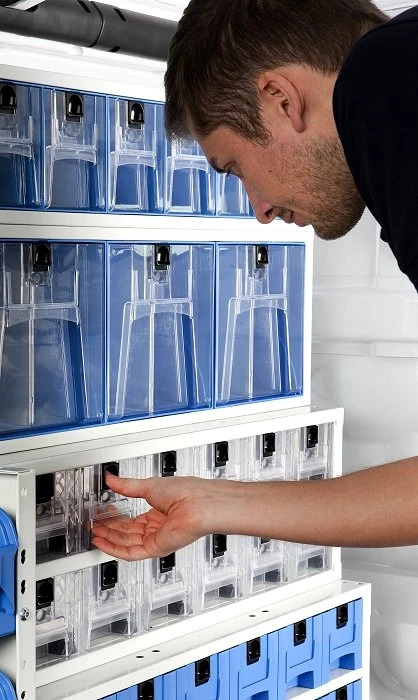 The lastest generation cabinet system has a body of steel, and plastic transparent drawers that are even more practical to use than ever. 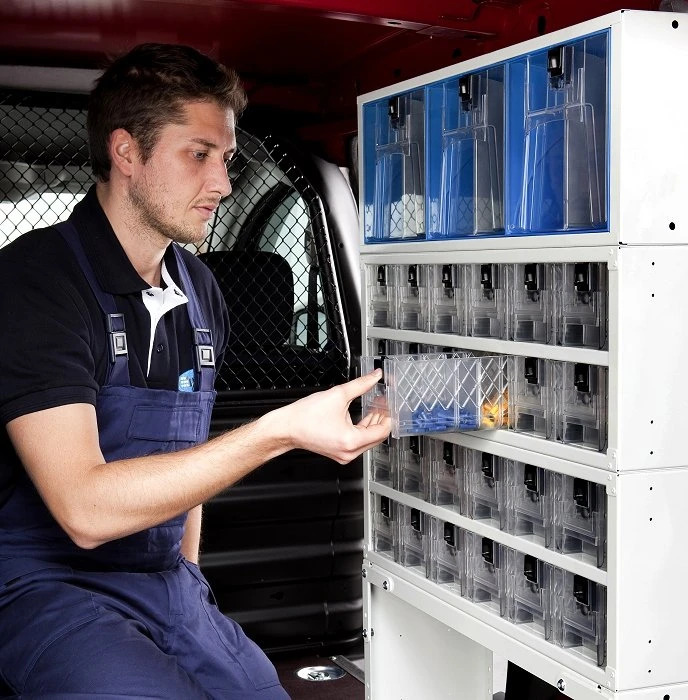 Drawer module for vans with pull-out transparent plastic drawers, series CTE. The body of this module is made in high-resistant solid steel. It measures 241 mm in height, only 216 mm in width, and comes in 3 different legnths: 507, 760 and 1,014 mm. The number of drawers ranges form 12, 18 or 24, according to the length. 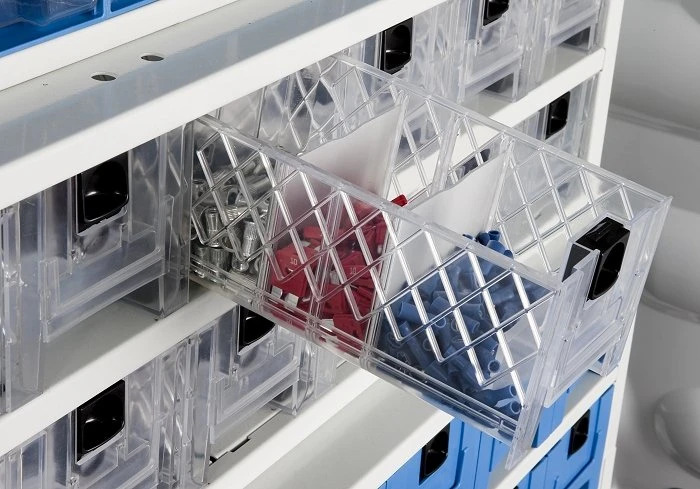 Each drawer can be divided into 3 separate compartments, using the provided aluminum dividers. This mens that using the largest model and putting in all the dividers, makkng it possible to store up to 72 different items in a single module. The drawers are made of a high quality plastic, not affected by UV light, and therefore not afflicted by aging problems normally associated with plastics of lesser quality, including yellowing and becoming fragile and brittle. The front of the drawers has no protruding parts, helping to reduce bumps and breakage. The drawers slide on special low-friction plastic glides. A spring system lets the user know when the draw has been pulled out nearly to its full extent. Each drawer can also be easily removed, if necessary. Thanks to a central locking button, all the drawers can be solidly and automatically locked in position. Unlocking the drawers is just as simple. 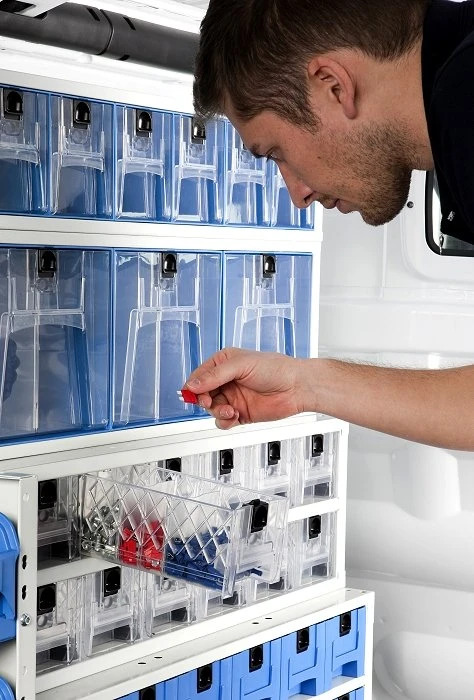 The key to this latest generation drawer design is in its transparency, which allows immediate identification of the materials and objects inside without having to pull out the drawers – reducing time and making work easier.